Some people recommend that students take their first test in the Spring of junior year. I simply disagree. I'm not against taking it a second time in the Spring if the early test doesn't go as planned, but I do not believe that junior year is conducive to preparing for this test. Yes, you will theoretically be 7 months "smarter" by May because of the passage of time, but I don't believe this outweighs the advantages above. 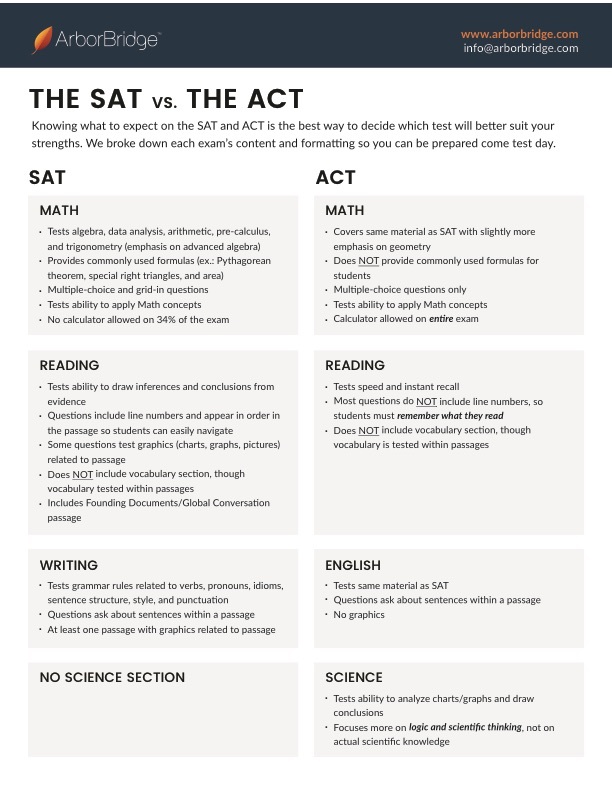 My strong advice is to take a new, fresh diagnostic SAT and ACT one week apart from each other to see which test you perform better on. I don't like the idea of using a PSAT score from 10 months ago. I want two new scores, taken one week apart, in the same test-taking environment. I want an apples-to-apples comparison. How do you do this? ArborBridge will mail you a hard copy of each practice test. Once you receive the tests, ArborBridge will schedule a time for you to take the exams using an online proctor tool that guides you through every section of the tests. You take the tests from home (ideally, one week apart). Then, ArborBridge grades the exams and supplies you with a comprehensive report on how you performed and where you need to focus your efforts. This is a free service. ArborBridge does offer tutoring services, but you are under no obligation to commit to anything. In the summary of your scores, ArborBridge will advise which test is better-suited to you. 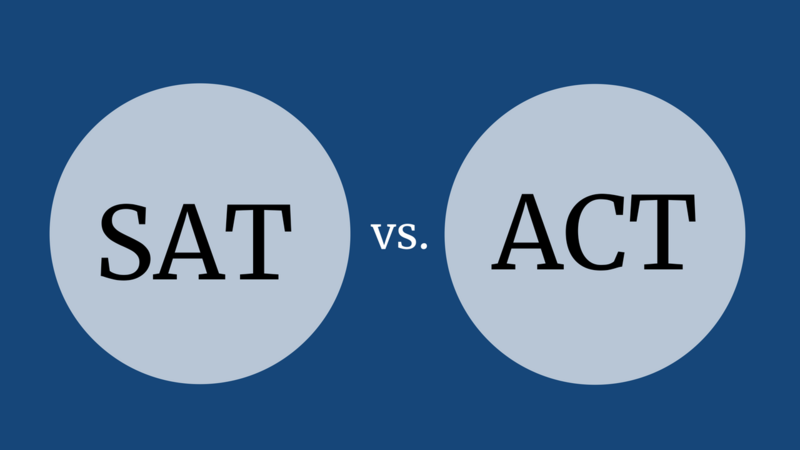 If you decide not to use ArborBridge and use two pre-existing scores, you should use the "concordance chart" link below to figure out if you are pre-disposed to performing better on one test over the other. In many cases, the results are even and there is no discernible difference. Okay, by now, you should know which test to focus on. This is where you will have to consider where you live, available tutors, how much you are willing to spend (if anything), how motivated you are, and your summer schedule. How much should you study? Well, I tell all of my PrepWellers that it depends on how well you want to do. As in life, there is typically a strong correlation between work and results. A student who wants to do their best should be willing commit the month of August to significant study. For some students, this means 10 hours a week. For others, 25+ hours a week. I hope it's clear how important I believe this summer can be for you. I know as a parent, that not every child will have the motivation or discipline to execute this plan to its fullest. I try to give you my best advice assuming you're a student who want to be their best.